• Moisturizes & softens Ingredients: Organic fine sugar cane, brown sugar, coconut oil, kukui nut oil, coconut milk, pink kaolin clay, coconut flavor, glucose, & enzyme. 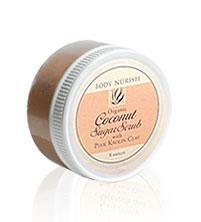 DIRECTIONS: (Entire Body) Scoop generous amount of sugar scrub & rub vigorously onto dry or slightly wet entire body. Rinse thoroughly with warm water. [Recommended use: Daily for Face & Neck) In palm of hand mix 1/2 tsp. of sugar scrub with 1/2 tsp. of water. With a very light touch massage mixture gently onto face & neck. Rinse with warm water.